Concern over sugar intake is rising, even with our clients. According to the 2015 Food and Health Survey (International Food Information Council (IFIC), 2015), sugar found in food is causing consumer concern during food purchasing decisions. In fact, sugar is one of the top three considerations when purchasing food, only behind whole grains and calories. And there is a new opportunity to educate our clients on ways to reduce sugar, with a new low calorie sugar, allulose. Allulose (also known as D-psicose) is a monosaccharide, or simple sugar, which exists naturally in our environment. Found first in wheat, and later in fruits like jackfruit, figs, and raisins, allulose has 90% fewer calories than sugar. Allulose is also naturally present in foods like caramel sauce, maple syrup, and brown sugar. Allulose is considered GRAS (Generally Recognized as Safe) per the US Food and Drug Administration (FDA) and will soon be used as an ingredient in manufactured foods and beverages. We can educate our clients on the meaning of GRAS by explaining that any substance that is intentionally added to food is a food additive has undergone extensive evaluation. The evaluation includes a scientific review to demonstrate safety of the substance under its intended use. Allulose has been found to be safe for people of all ages for use in moderate amounts. Allulose is unique in that while some of it is absorbed, the body does not recognize it as a carbohydrate. And because of this, it is not metabolized and researchers have found allulose to have no impact on blood glucose levels. It provides negligible calories at 0.2 kilocalories/dry gram. 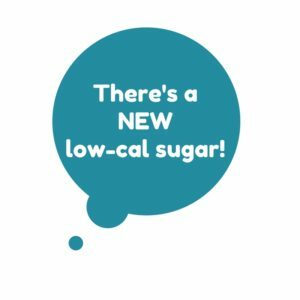 With a flavor that is similar to sugar, yet only 70% as sweet, it’s an appealing lower calorie alternative for clients that wish to reduce sugar intake, as well as those who are working towards a healthy weight or for use with clients with diabetes. Researchers have also found allulose to be well tolerated without causing any gastrointestinal symptoms as it is not fermented during digestion. You may soon find allulose in carbonated or non-carbonated beverages, as well as frozen and non-frozen desserts, yogurts, jams and jellies, chewing gum, candies, sweet sauces and syrups, gelatins and puddings, as well as fat-based cream used in modified fat/calorie cookies, cakes, and pastries. As rates of obesity and diabetes rise across the US and around the world, more and more people are looking for low-calorie and low-sugar versions of their favorite foods to help them control their weight without sacrificing what they enjoy eating. In the most recent version of the Dietary Guidelines for Americans, which is developed by the US Department of Agriculture (USDA) and the Department of Health and Human Services (HHS), it is recommended that adults and children limit their intake of sugars, especially added sugars. The Guidelines recommend consuming less than ten percent of daily calories from added sugars. For someone consuming 2,000 calories per day, this means no more than 200 calories from added sugars, or about 12 teaspoons. The US Food and Drug Administration (FDA) is also working to revise the Nutrition Facts Panel on food and beverage labels. One of the proposed recommendations is to label the amount of added sugars in a product. The FDA has also proposed a percent daily value (%DV) for added sugars of ten percent, a value which is mimicked in the Dietary Guidelines for Americans. One way to help lower consumption of sugary foods and beverages is by looking out for products made with low-calorie sweeteners. One such sweetener is allulose, a low calorie sugar with about one-tenth the calories of regular sugar. This negligible amount of calories is due to the fact that allulose is not completely metabolized by the body. While allulose has fewer calories than sugar, it is still classified as a carbohydrate and a sugar. Therefore, the presence of allulose in a product will affect the amount of carbohydrates and sugar listed on product labels. However, it should be noted that though the number of grams of carbohydrates and sugars might look similar to a full-sugar product, the amount of calories will be reduced when allulose is used in place of some or all of the sugar content of the product. For more information about allulose, please see our Frequently Asked Questions page.